Here’s some good news for anyone who’s ever accidentally hit “Reply All” on an e-mail that they only meant to send to a single recipient—revealing their family’s secret chili recipe, maybe, or confessing to a capitol offense. Google has released a “new”—that is, available but largely unannounced for the last six years—feature to its popular Gmail service: the ability to undo a sent e-mail for up to 30 seconds after the erstwhile missive was deployed. Yes, no longer will you have to engage in sitcomesque hijinks, sneaking into your coworker’s homes to manually delete the records of your sexual peccadilloes from their Outlook Express. Never again will you have to weepingly chloroform your Nonny so that she’ll never read your ill-sent dark thoughts about ugly Cousin Earl. Now, with the click of the Undo button, all those dark timelines can be averted. Of course, the feature isn’t actually magic, and would in any case be better categorized as a “delay” feature; it simply holds your message for a set period of time (5, 10, or 30 regret-prone seconds) before sending it on its way. 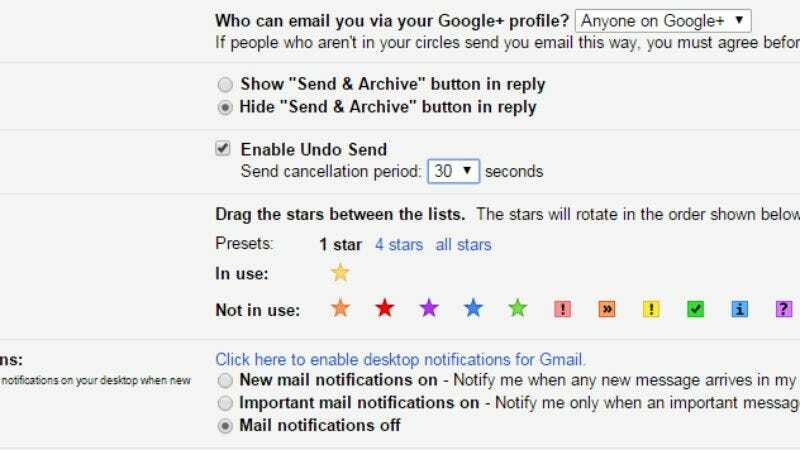 If you’d like to enable the feature (and the subsequent panicked moments as you race your mouse toward the Undo button, desperate to beat the clock and/or social ostracization), just go into the settings section of Gmail (represented by a cog wheel) and turn it on.